Q: How can I become a member of the Smithsonian Institution? A: You can find Smithsonian membership information here. Q: I am a writer interested in submitting my work to AIR & SPACE Magazine. What are your guidelines? A: You can find our writer's guidelines here. Q: Who do I contact to request permission for use of articles or images from AIR & SPACE magazine? A: Please send all rights and permission queries to csheen@si.edu. Q: How can I obtain a copy of a printed article from a current or back issue? A: Unfortunately, we do not offer printed copies of current or past articles to subscribers. You may, however, order a copy of the current or back issue (see below). Q: How can I order a copy of the current issue or a back issue? A: A copy of the current issue costs $6.99. A copy of a back issue costs $7.00; however, some back issues are out of print. * There are no shipping fees for issues sent within the United States. For shipping outside the US or questions about availability please contact James Babcock at babcockj@si.edu. To find out in which issue an article ran, you can search our site, or call toll-free 877-240-1183 and ask for Reader Services. • All issues prior to and including January 2006 are out of print, including the charter issue (May 1986). • Most issues from March 2006 to date are available, although many in limited quantities. Q: How can I get in touch with the author of an article or someone mentioned in the article? A: It is our policy not to give out addresses and telephone numbers of our writers or people mentioned in our articles. We will gladly forward a letter on behalf of a reader, but we cannot guarantee that the addressee will respond. 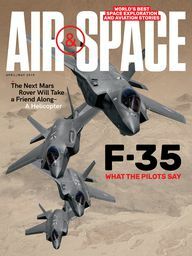 Q: Is there a cumulative index for AIR & SPACE Magazine? A: We have no immediate plans to publish the index. Q: I am interested in advertising with AIR & SPACE Magazine. Where can I find general rates and media kit information online? A: You can find advertising information here.